After months of heated debate, ear-splitting protests and legal maneuvering, Gov. Scott Walker's collective bargaining law is finally set to take effect.Secretary of State Doug La Follette published the law in the Wisconsin State Journal newspaper on Tuesday. The measure goes into effect today, capping a tumultuous four months in Madison that saw state senators flee the state and massive protests at the State Capitol...The law requires almost all public employees on all levels of government — from teachers to librarians to State Capitol janitors — to contribute more to their health care and pensions. The changes amount to an average 8 percent pay cut. 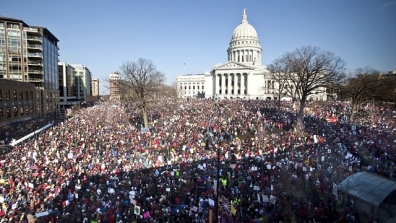 The bill also strips them of almost all their collective bargaining rights, allowing them to negotiate only on wages...Meanwhile, a coalition of unions, including the Wisconsin Education Association Council, the state's largest teachers union, have filed a federal lawsuit in Madison alleging the law violates the U.S. Constitution by taking away union rights to bargain, organize and associate. The anti-union law was held up in the courts, but 2 weeks ago the Wisconsin Supreme Court upheld the law in a 4-3 ruling that saw Wisconsin's Justices literally get violent with each other over the issue, with Justice David Prosser putting female Justice Ann Walsh Bradley in a choke hold. (out of control, right?) Chief Justice Shirley Abrahamson wrote a nasty dissent against Justice Prosser and the the majority, accusing them of playing partisan politics from the bench. In addition to the battle in the courts, the citizens of the state of Wisconsin have already declared their intentions of recalling Governor Walker pursuant to state law after his first year in office is complete in January of next year. Meanwhile, in nearby Ohio, the people have collected 1,298,301 signatures to place Ohio's anti-union law on the ballot for repeal; only 231,000 signatures were required by state law. It's also notable to observe that there are only approximately 400,000 state workers in Ohio, yet over 3 times that amount supported the initiative to place this bill on the ballot. According to Ohio law, the anti-union bill is now placed on hold until it comes to a vote before the people on November 8th of this year. Republicans in both state and federal government often phrase their policy talking points as being the will of "the American people," but with such significant opposition in both Ohio and Wisconsin over this issue by the American people, it is difficult to see how that is possible here. 1. Should Wisconsin's law be decided in a federal court? 2. Should Ohio's law be placed on the public ballot in November? 3. Will Gov. Walker survive the recall vote in January? 4. Do state workers' unions really need collective bargaining? 5. Are state workers, in fact, overpaid?